Most of the titles on Blu-ray or DVD that I get in to review I’m going in completely blind with. I’ve watched a lot of content over the years but there is just so much that interests me that I rarely will have watched any of it beforehand. For once, that isn’t exactly the case with Damages: The Complete Series as I actually watched the first season when it was airing on FX in 2007. Back then, I thought the series took awhile to get going but it eventually grew into a decent show. Upon my second watch for this review, I actually think I underrated the show quite a bit. While the first few episodes are still a bit slow, I can now see why it was so highly rated when it first aired. The first season of Damages was the only season I watched while it was airing so outside of that, the rest of the content on this release was completely new to me. The rest of the seasons kind of have a familiar pattern to the first season. They take a few episodes to get going but things start to heat up around the fourth episode of the season and the show gets much more interesting from that point on. I don’t think any of the four followup seasons ever quite reach the heights of the first season, but they are still consistently good to great and should be watched as well. Damages is yet another of the great FX shows from the mid-to-late ‘aughts that helped the cable channel become one of the premiere networks for prestige dramas. Mill Creek Entertainment has already released a few of those great FX dramas in complete series sets (The Shield and Rescue Me) and Damages: The Complete Series is the newest to hit store shelves. The series was nominated for numerous Emmy’s and other awards (with Glenn Close winning two Emmy’s and Zeljko Ivanek picking up a supporting actor win), though the nominations started to dry up after the third season (which likely had a lot to do with the show’s move to DirecTV’s Audience Network). Damages is a legal thriller that stars Glenn Close as Patty Hewes, a cutthroat lawyer who will do almost anything to destroy powerful people or evil corporations and deliver enormous lawsuit judgements or settlements to her clients. Her co-lead is Rose Byrne as young lawyer Ellen Parsons who joins Hewes’ firm but isn’t quite as willing to do anything to win. Each season of Damages tackles a new story, with each involving a new case that Hewes and/or Parsons become involved in. These cases involve a CEO defrauding his employees, an energy industry and environmental issues case, and stories based loosely on Bernie Madoff and the Blackwater Security Consulting scandal. Outside of these brief descriptions of each season’s cases, I can’t really go into too much detail about the story without spoiling way too much. The show features these legal cases as well as a serialized story that continues throughout the series involving the relationship between Hewes and Parsons. 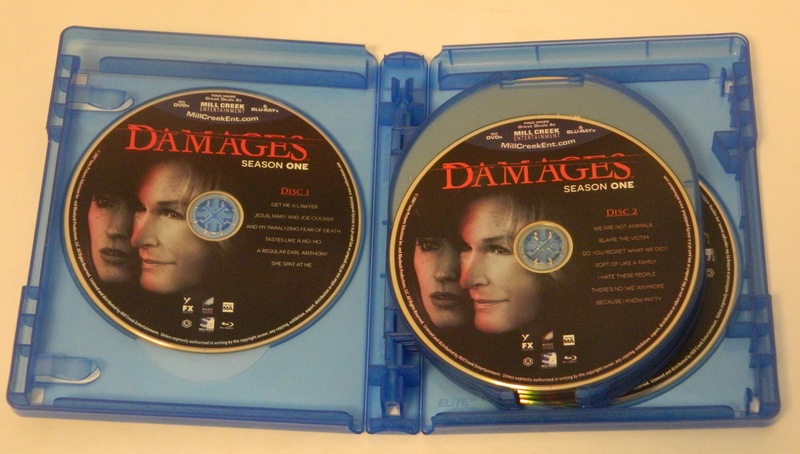 Damages even utilizes flash-forwards throughout the series, usually focusing on an important event that will happen towards the end of the season’s case leading viewers to wonder how the story got to that point. As the season goes on, more tidbits about that event are slowly revealed until the show catch up to the flash-forwards. One thing that really works in Damages: The Complete Series favor is the fact that almost all legal shows tend to be procedural where each case is wrapped up with a nice bow on it at the end of each episode. There are precious few serialized legal shows like Damages. As a person who has always been interested in the law but prefers serialized series over procedural shows, there are far too few of these types of shows out there. In addition to featuring season-long cases (giving them much more time to breathe and develop), the series long story is also quite interesting and will keep you watching even if you aren’t as interested in one season’s case as some of the others. A lot of serialized shows tend to have a few very important episodes sprinkled throughout the season where lots of huge story progress is made (meaning that many of the other episodes feel like filler). Outside of a few episodes of Damages that have a lot of reveals (like “I Hate These People” for example), this show tends to be more of a slow-boiler where huge events are spread out more evenly. There aren’t many episodes with a ton of reveals but almost every episode has at least one key event. Damages doesn’t show its full hand in just two or three essential episodes, it slowly doles out its reveals in smaller spoonfuls. That makes the episodes more consistently good but also means there aren’t as many amazing episodes as other series have. The seasons are all pretty consistent overall. Season one is definitely the best but the rest of the seasons are just a shade below it with very little variation between years (though season four is just barely the weakest). In addition to the well-known Glenn Close and Rose Byrne, lots of “name” actors made appearances throughout Damages’ five season run. Both Ted Danson (in a rare dramatic and villainous role) and Tate Donovan are series regulars for multiple seasons. One season actors include William Hurt, Marcia Gay Harden, Timothy Olyphant, Martin Short, John Goodman, Ryan Phillippe, and Zeljko Ivanek. The acting in Damages is top-notch and absolutely one of the biggest positives about the show. Close won multiple awards for her role, Byrne is almost her equal, and the guest acting is almost unanimously great (though that shouldn’t be too shocking based on the great actors the show always got for these roles). There are a bunch of psychopathic characters (and very few characters to actually root for) on this show but since they are played by such great actors, they make it work anyway. 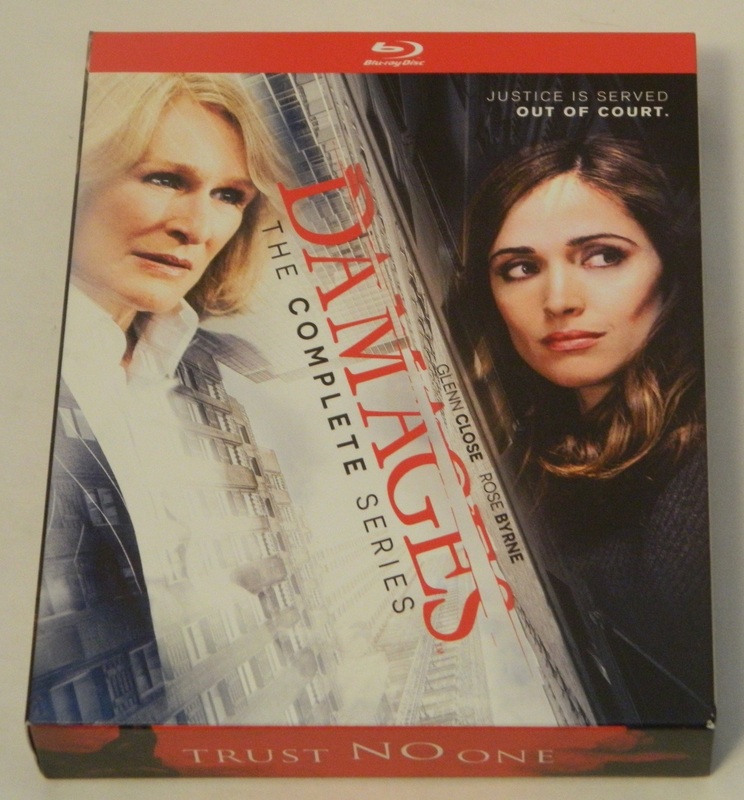 Damages: The Complete Series was released by Mill Creek Entertainment on both Blu-ray and DVD. I received the Blu-ray version, which looks quite good except for the flash-forwards in the first season. Since the show starts with a flash-forward, I originally thought I somehow received the first disc on DVD instead of Blu-ray. It took me awhile to realize (and remember) that those flash-forwards had a “unique” style involving weird colors and lots of pixelation. It’s just the way these scenes were shot as it features a disoriented and shaken up Ellen and the style was likely meant to convey her situation. Thankfully, flash-forwards in subsequent seasons look far less extreme and thus much nicer on Blu-ray. Other than those weird scenes in the first season (and some outside scenes that don’t look quite ideal), I didn’t really notice any problems with Damages: The Complete Series on Blu-ray. The image is definitely compressed (each season was forced to fit onto two Blu-rays for a total of ten overall), especially the first three 13-episode seasons. This does get better in the final two seasons, which only had ten episodes apiece. Overall, videophiles may not be impressed by this presentation but for the average viewer, Damages: The Complete Series looks and sounds perfectly fine. Outside of season one, this is the first time the other seasons have been made available on Blu-ray. The packaging on this release is very similar to recent Mill Creek Entertainment complete series releases. All ten discs are housed in an enlarged Blu-ray case with each getting its own disc holder (the discs aren’t stacked like older Mill Creek releases used to be). The outer box is pretty thin cardboard but the packaging that really matters (the case) is relatively sturdy. One thing that is pretty disappointing about this release is the lack of bonus features. All of the DVD releases had at least some extras so to not even move those over to this release is a major disappointment. I don’t really expect new extras but the special features from the previous releases should have been included here. However, this release of Damages: The Complete Series is still a very good value as it could be found for as low as $40 on Amazon at press time. Overall, Damages: The Complete Series is a very good (and great value) release of a truly great series. While the series never quite recaptures the magic of the first thirteen episodes (or actually like the last ten of those thirteen), it does come very close at times. Damages is an early prestige show that based on the low ratings it received, lots of people have never heard of or ignored entirely. While it is slightly dated (at least compared to today’s prestige shows), I do think it is absolutely still worth watching. If you are one of those viewers who never heard of it or ignored it, you really should give it a try. Recommended. Damages: The Complete Series was released on Blu-ray on February 26, 2019. We would like to thank Mill Creek Entertainment for the review copy of Damages: The Complete Series used for this review. Other than receiving the review copy we at Geeky Hobbies received no other compensation. Receiving the review copy had no impact on the content of this review or the final score. Glenn Close and Rose Byrne are great in the lead roles and each season adds new well-known actors to the roster. Amazing acting throughout the series. Damages is one of the few legal TV shows that features season-long cases (as well as a series long story) instead of weekly ones that are wrapped up in just 40 minutes. While each season does take a few episodes to really get going, once they do the story will hook you. The show never quite reaches the greatness of season one in its subsequent seasons (though it does come close at times).